Children’s Mental Health week in the UK runs from February 5th to the 11th. One publisher has sent me a story specifically for this week, and there’s a gathering number of voices who are publishing books that speak to children’s mental health issues. But reading any good narrative enables the reader to step into someone else’s shoes, to experience their story, and hence gain some empathy on another’s state of mind. But as well as that, some books relate more directly to the reader’s own experience – if the characters are going through a situation that they too are experiencing, the reader can see how the characters react. 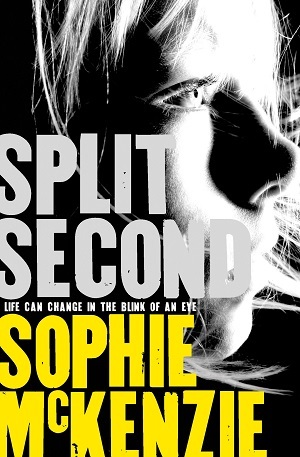 How do they deal with the darker side of life, how do they overcome their obstacles? In turn, the reader may review their own situation. The book may not offer a solution, but it can show readers another way of thinking about things, perhaps a different way through their dark time. Someone asked me recently what comes first – if readers learn resilience through books, or if they come to certain darker books with resilience, enabling them to read the books without fear. It’s a tricky one. Some resilience is innate – there are children who accept scary books quite readily, others who approach them with horror, but some resilience is garnered through the reading of difficult situations and issues. Most of all, books offer a safe space in which to experience the darkness of life, and also show how others perceive a similar darkness. Reading, funnily enough, can be less isolating. 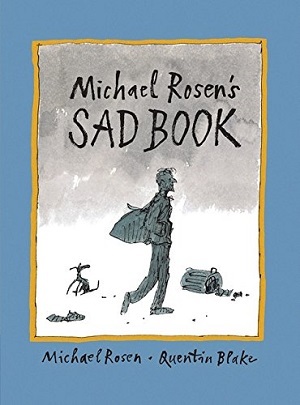 Michael Rosen’s Sad Book, illustrated by Quentin Blake is a great example. Rosen wrote the book as a reaction to the death of his son – which is stated within the first few pages. But he also talks about a general sadness that can come over any of us at any time. The book also explores ways in which Rosen tries to overcome some of the sadness, by thinking about good things he has done that make him proud, or remembering that other people are sad sometimes too. 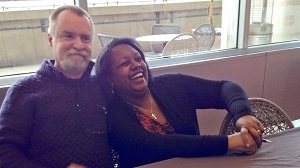 It’s good not to be alone. Talking through the sadness helps him as well. 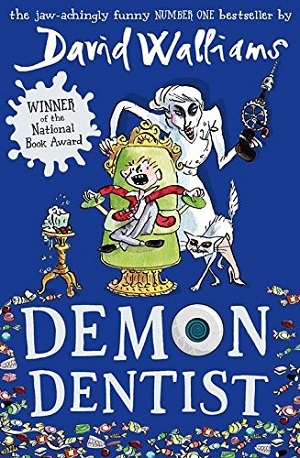 This is a deservedly award-winning book, which prompts all kinds of emotions, both through the simplicity of the book, but also through Quentin Blake’s astonishingly emotive illustrations. The book takes the reader through the different layers and types of sadness, from that which settles like a weight, to the sadness at the edges of the happiest things. Emotions are not isolated – they come in a tangled heap, sad with angry, sad with frustration, and sad with happy. 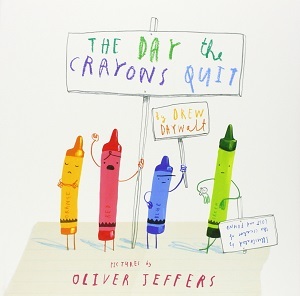 But most of all, this is not a book to which a child needs to bring their resilience. They will find it in the pages within. You can buy it here. 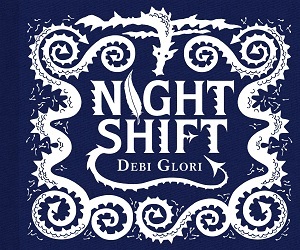 One newer book on the scene is Night Shift by Debi Gliori. 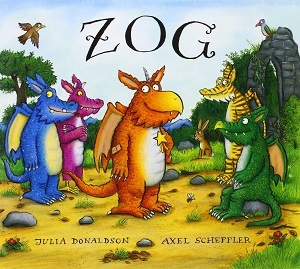 This small formatted picture book is targeted at a teenage audience. Even its size and beautiful production (fabric cover) give away this book’s topic – depression can make you feel small, and anything that relieves it can be beautiful. 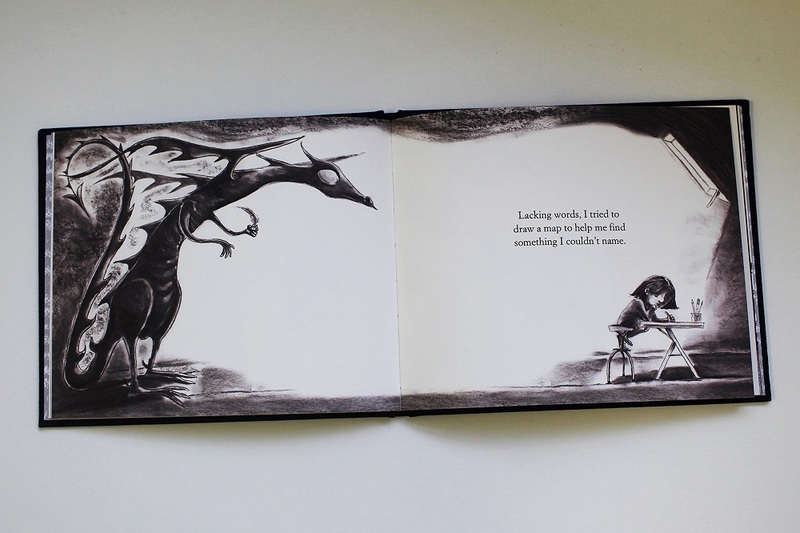 Gliori draws on her own experience of depression to illustrate this book, showing the illness in the form of a dragon in her charcoal-like illustrations. At first the dragon’s steam is a fog rolling in at night, but soon it pervades the day. Gliori highlights the physical effect of this mental illness in all its debilitating forms, but all beautifully drawn onto the normal day of a teen girl. Gliori then goes on to highlight different ways in which the girl tries to rid herself of the feeling, from talking about it, drawing it, living with it. One of the most startling pages is the one in which she addresses the platitudes that are given to her: “chin up”. There is a resolution at the end – her own way of finding a small beauty that helps the fog to lift, the dragon to fly away. As in Rosen’s book, it’s the skill of the simplicity of the language to convey the feeling, and the essence of sharing and hopefulness despite the darkness. You can buy one here. 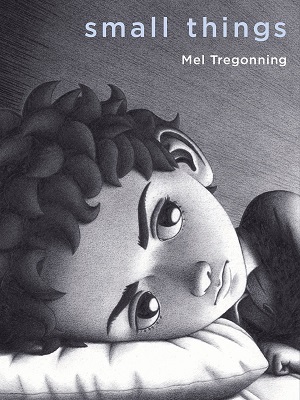 Another starkly compelling and moving picture book is Small Things by Mel Tregonning, completed posthumously by Shaun Tan. The title is ironic of course – what the protagonist deals with here is not small at all. This wordless black and white graphic novel deals with one small boy’s misery at school – excluded from sports and friendships. His schoolwork is suffering too, and slowly the reader starts to see strange shapes and shadows that invade and penetrate the boy’s world. These take over, keeping the boy up at night, eating away at who he is. The illustrations are painful to take in sometimes – the small boy’s sadness manifested in his large head and eyes, the anxiety and angst all too clear, the shapes and his disintegration fairly horrific. But when he shares his feelings with his sister and then confides in his parents, things start to change. Finally, he sees that he is not alone in the strange creatures – gradually, the boy sees that others have the shapes to deal with too, and so feel as he does and a bond is formed. It’s not a complete resolution, but a path forward. The book comes from a place of pain, but the idea is that it provides solace to those who otherwise may not have reached out. Wordless, it screams louder than most. It’s available here. 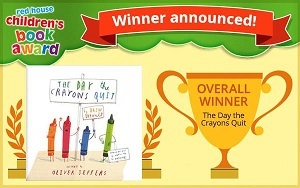 The last book is the one sent to me by a publisher for this year’s Children’s Mental Health Week. It’s a book that aims to explore and teach mindfulness. 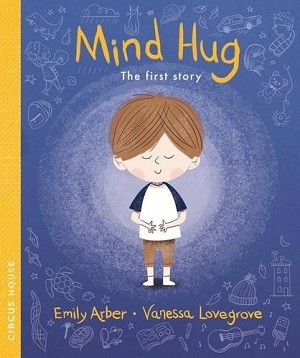 Mind Hug: The First Story by Emily Arber and Vanessa Lovegrove shows a boy upset by the influx of noise inside his head, the buzziness of everyday life, but also the thoughts that can erupt from nowhere. Then his father shows him how to breathe and to dismiss the overcrowding. It doesn’t work at first go, but the boy tries again. In the end he shares it with a friend, who shares it again. The idea, like mindfulness, is relatively simple, and the premise good. Unfortunately the text is a little all over the place, with some rhyming, some not, and a rhythm that comes and goes. You can buy it here. But it’s not just picture books that bring awareness of mental health, and I’ve highlighted a couple of others here. Like so many other ‘issues’, sometimes the best books are those that nudge a child towards the issue rather than focus the entire book on it. Flour Babies by Anne Fine is an excellent example – when the children in school have to look after their own ‘flour sacks’ as babies, and learn many things in the process. Aubrey and the Terrible Yoot by Horatio Clare talks about the difficult subject of parental depression all wrapped within a beautiful nature adventure story, Boy in the Tower by Polly Ho Yen and A Library of Lemons by Jo Cotterill also deal with depressive parents, but again, next to well-told stories. The protagonist in The Goldfish Boy by Lisa Thompson has OCD, but the book reads as a mystery. 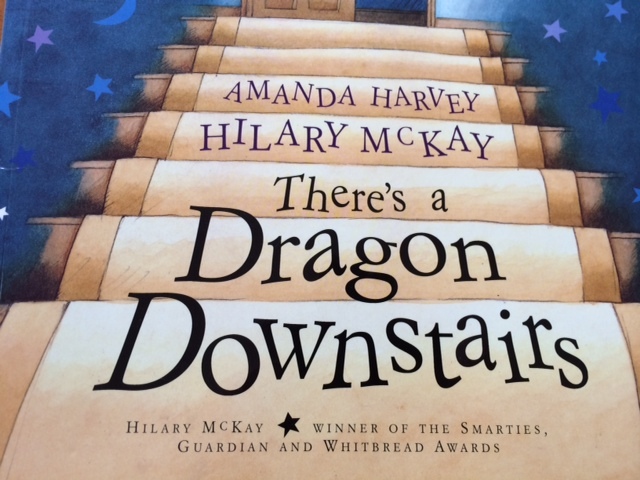 By opening up a book with a fictional cast of characters but with very real problems, it’s hoped that children can find a way through, discover a path they may not have thought of, see a light in the dark. Have a look at The Empathy Lab here, for more ideas.